Publishers increasingly are using Facebook, Google and other social media platforms to distribute content to readers. 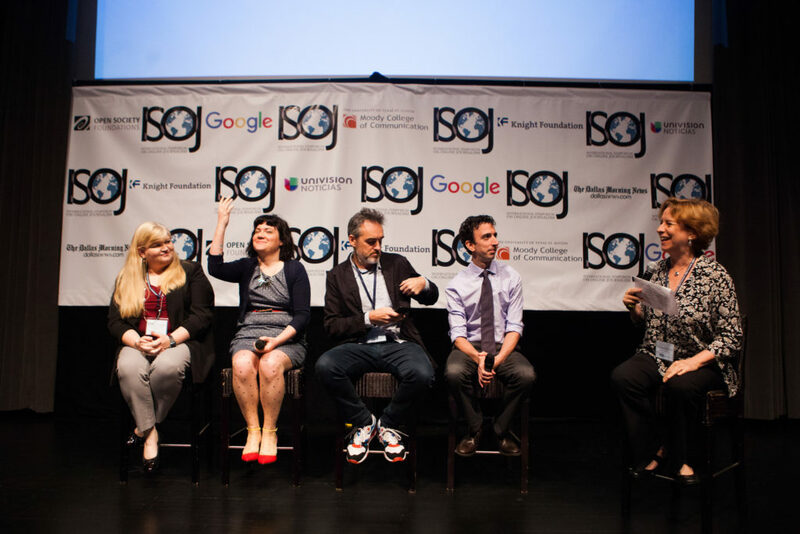 Whether journalism will survive in a media ecosystem where publishers do not control all of their distribution channels — the topic for the opening panel of the International Symposium on Online Journalism (ISOJ) on Friday, April 15. Panel chair Vivian Schiller, an independent advisor, formerly with Twitter, NBC, NPR and The New York Times, introduced the challenging topic and invited four editors and producers to discuss it before a packed audience in the Blanton Museum of Art on the campus of the University of Texas at Austin. David Skok, managing editor and vice-president digital of The Boston Globe, started by highlighting the relationship between Dell with the Taiwan-based Asus, which over time persuaded Dell to let it build the Austin company’s motherboards, assemble its computers and handle logistics. Skok said the same thing is happening in the publishing industry, that publishers should be aware of the Dell example that while technology optimizes for reach, engagement and scale, journalism optimizes for impact. Echevarría said that with the use of the social media platforms, Univision’s video traffic has increased. This is good for the audience, he said, but bad for the business model. “I believe newsrooms and journalism are moving much faster to think about audience than business,” he told the crowd. To find a balance, he added, it is necessary to, among other things, embrace the start-up mode and adapt video content for different platforms. 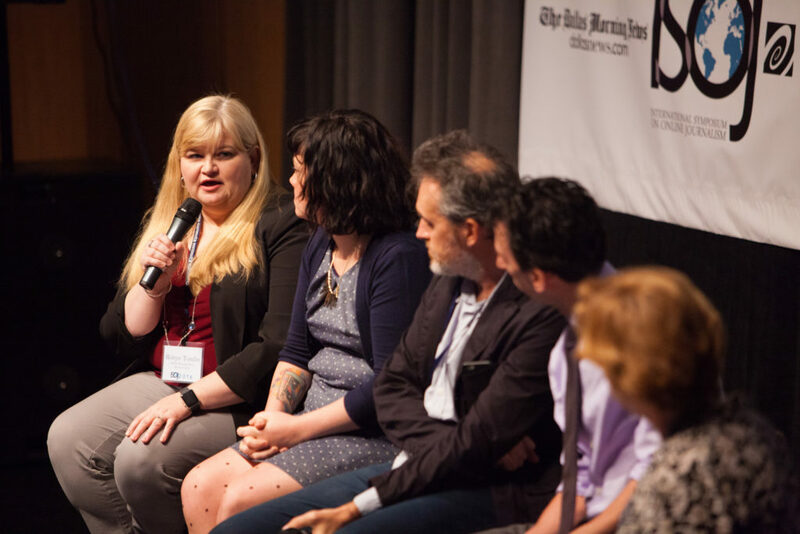 A closer look at how local newspapers are dealing with the question of distributed content was presented by Robyn Tomlin, vice-president and managing editor of The Dallas Morning News. She said the topic presented challenges but also opportunities. “My feeling is that distributed content is one of the things that can help us. In Dallas we are taking the approach of testing and learning. A step-by-step approach,” she said. For her, one of the big values of using platforms like Facebook, Twitter, Snapchat or Instagram is that they can widen the “audience value pipeline” and help target the audience. But at the same time, there is the challenge of finding a dedicated editorial staff to develop and sustain The Dallas Morning News’ “voice.” In addition, monetization opportunities are limited, she added. A much more optimistic view on this new environment was presented by Summer Anne Burton, executive creative producer at BuzzFeed. She said BuzzFeed is a “testing center,” and that 18 months ago the company pulled together a team of creative people to work on distributed content. “We are very willing to adapt. We want to reach as many people as we can. And the way to do that is following people were they are,” she said. Burton shared some successful strategies from BuzzFeed in dealing with different platforms, including thinking of distribution as a creative art, try a lot of variations on a theme and test and learn from the experiences. This 17th annual edition of ISOJ, which continues on Friday and Saturday, is being livestreamed in English here and in Spanish here. ISOJ 2016: Distributed Content Panel, from Knight Center on Vimeo.